The Honourable John Hickey, Minister of Labrador Affairs, and the Honourable Patty Pottle, Minister of Aboriginal Affairs, responded today to the Canada Northern Strategy: Our North, Our Heritage, Our Future report released by the Federal Government this week. The ministers described the strategy as little more than a compilation of previously announced commitments and policy directions. So there you have it. Compling previously announced stuff into a grand "strategy" is bad, mkay? Well, at least it is when someone else does it. The Nunatsiavut Government is interested in taking the first, tentative, and relatively inexpensive steps towards a possible future road link to the North Coast of Labrador, and are even willing to put up 80,000 of their own beans towards the preliminary feasibility study, a study which they have been promoting for the past three years. The $80,000 is said to represent 40% of the costs of such a study. For some reason, the province of which Labrador is supposedly a part doesn't want to play along. The thing that sort of was disappointing for us is some of [Minister Hickey's] statements seems to be that this could take probably thirteen, fourteen years before the [Trans-Labrador Highway] is completed. And we had asked the province to do a feasibility study in extending the Trans-Labrador into Nunatsiavut, and we saw this in phases as well. The first phase of which would connect the communities of Rigolet, Makkovik and Postville into the Trans-Labrador. Responses again that we have had, from three different transportation ministers, "we will not entertain at all a feasibility study until the current work on the Trans-Labrador is done." Now, if that is thirteen, fourteen years away, that means, according to the letters that I have, that we're gonna have to wait thirteen, fourteen years for a feasibility study. Back in 2004, curiously enough, there was no such hesitancy on the provincial side, and certainly no requirement that the Trans-Labrador Highway be "done", before launching holus-bolus into the $350,000, promptly shelved, "pre-feasibility study" into the Danny Williams Memorial Tunnel. Danny Williams-Government inserts itself into the Romaine environmental assessment. Hydro-Quebec inserts itself into the Lower Churchill one. And then some. Let the fustigation and confounding commence! Vale — as in Vale Inco? It's two syllables. Really. It’s scandalous! I only hope our current government doesn’t get any ideas from it. Heck, it’s probably too late, on both the anti-blogger and pro-grovelling newspaper apology fronts. In 1967, the federal government, with the acquiescence of the Smallwood government, denied us our rights - set out in section 92 of the Canadian Constitution - to wheel Upper Churchill hydro power through Quebec to the markets of Ontario and the northeastern United States. J.A. is welcome to point to which paragraph of s. 92 of the “Canadian Constitution” furnishes this imagined right. Be specific now. A section which still doesn’t provide for the imaginary “right” to wheel Upper Churchill power out of the country, a right which J.A. says was denied. Section 92A also has the factual inconvenience of not having been part of the constitution in 1967 – whatever significance that year is supposed to have had. Section 92A, in fact, is part of the constitutional reforms enacted in the early 1980s under the leadership of a Prime Minister whose name escapes (but it wasn’t Mulroney.) Quite remarkable, really, that this imaginary right could not only be denied, but it could be denied fifteen years before the right was imagined into imaginary existence in the first place. Curiously, the question of compensation for surrendering our rights under section 92 has never been taken into account. Still, the Harper government continues to deny us our rights under the Atlantic Accord, thereby depriving us of billions of dollars in oil revenues while Quebec coffers continue to swell with the revenues from the Upper Churchill in a deal that has this province locked in until 2041. Again, J.A. might want to elaborate a little on those points. Which “rights” under s. 92? And which “rights” under the Atlantic Accord? Really, now, J.A. : be specific. Danny Williams-Government cost-shifts His way out of another bit of infrastructure in Labrador, that ever-so integral part of the province, at least on tax day. And no, this time it's not Louis St-Laurent who's on the hook. The Aurora has news coverage, and a possibly treasonous, PNC-laden editorial. First He channels Joey Smallwood, now Brian Tobin. Cf. the Labrador Health Centre funding arrangement from thirteen years ago. Building the People's Fibre-Optic Cable to the Island of The Province? A provincial responsibility, and a point of Our Dear Pride. The Newfoundland and Labrador government is mulling over a plan to provide a fibre optic connection to Labrador. "We believe that building infrastructure from the Northern Peninsula through Labrador and into Labrador West is absolutely essential." The system could cost as much as $80 million. The government may seek financial assistance from Ottawa to help pay for a fibre optic link to Labrador. The leader of the Liberal Party of Newfoundland and Labrador wants both the federal and provincial governments to help with providing cellphone service for southern Labrador. Such strange, strange behaviour in a province where, we are told, there is such a strong "desire among Newfoundlanders and Labradorians to cultivate greater ... financial ... autonomy vis-à-vis Ottawa", so irrestible, like the waters of certain rivers, that Danny Williams-Government wants to "harness" it. Yip. In all things, financial autonomy. Unless they are expensive, or are located in Labrador, and above all, if they are both. Instant-update: That "plan to provide a fibre optic connection to Labrador" that Danny Williams-Government was "mulling over" in 2006 — that's three years and an election ago — something that Trevor Taylor described as "absolutely essential"... what became of that plan, anyway? After a protracted and conspicuous silence, and possibly after having been sent for re-education, Hospitality Newfoundland and Newfoundland finds its voice again on the NALCO-Gros Morne-Danny Williams Memorial Power Line issue. Western Star coverage here, HNN statement here. That Danny Williams-Government sure is a funny guy. "My Government will harness the desire among Newfoundlanders and Labradorians to cultivate greater ... financial ... autonomy vis-à-vis Ottawa," he says. How does he cultivate greater financial autonomy vis-à-vis Ottawa? The Honourable Trevor Taylor, Minister of Transportation and Works, today set the record straight regarding the Provincial Government’s commitment to a regional airport for Port Hope Simpson, Labrador. "A detailed letter with a five-year plan was sent on September 5, 2007, by John Hickey our provincial transportation minister at the time, to the federal transport minister clearly stating our intention to move forward with this project with the help of our federal counterparts," said Minister Taylor. "We continue to press the Federal Government on this issue but thus far they have not stepped up to the plate," said Minister Taylor. "The Williams Government’s investment in Labrador is unparalleled in this province’s history and make no mistake this government is committed to creating a regional airport for Southern Labrador in Port Hope Simpson." Once those dastardly federal counterparts "help", that is, by paying 100% of the costs. Cultivating financial autonomy from Ottawa? You can't cultivate anything by salting the ground. Meanwhile, other than writing lots of letters asking Louis St-Laurent for money, how, exactly, has Financially Autonomous Danny Williams-Government "stepped up to the plate"? An isolated coastal aboriginal community, currently dependent on a standalone diesel plant, is about to get connected to the power grid. Radio-Canada has the story from La Romaine, on Quebec's Lower North Shore. Wildlife officials for Newfoundland and Labrador will conduct a count of the George River caribou herd in Labrador next year. "A Progressive Conservative government will ... release to the public every government-commissioned report within 30 days of receiving it, indicate the action government will take on a report's recommendations within 60 days, and ensure prompt public access to all government reports in hard copy and on the Internet..."
The talented Ms. Elizabeth Matthews has assured everyone that the "30 days" policy is still in effect — even though that implies, falsely, that it was ever in effect to begin with. Which brings us to today's announcement that Corrosion Study of Drinking Water Shows Good Results. Hooray! Such positive news! The following graphic is a screen cap of the transmission slip on the PDF version of that study. The "Re-issue" (?) 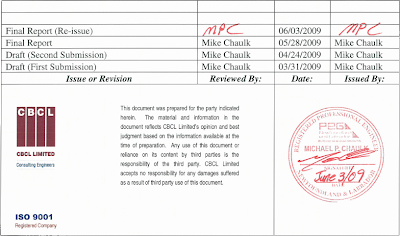 of the Final Report is dated June 3rd, 2009. The Final Report itself is dated May 28th. Today is July 16th. That's 43 days after June 3rd. Someone ought to do a study into the ethically corrosive effects of secrecy in Danny Williams-Government. My Government will harness the desire among Newfoundlanders and Labradorians to cultivate greater cultural, financial and moral autonomy vis-à-vis Ottawa. The Honourable Charlene Johnson, Minister of Environment and Conservation, announced today that the province will be participating with other organizations in efforts to determine the current status and health of the George River caribou herd. This work will include a review of current management approaches and methods and will be informed primarily by a planned census of the George River caribou herd scheduled to be completed in 2010. In collaboration with the Newfoundland and Labrador Departments of Environment and Conservation, and Natural Resources, the Nunatsiavut Government and the Institute for Environmental Monitoring and Research, the survey will be lead [sic] by biologists from the Government of Quebec in co-operation with the University of Laval. “We are very grateful for the generous contribution of the provincial government,” said Kathie Hicks. "I am very grateful for the opportunity to showcase my products in a larger venue and to a wider market," said Mr. Coates. “I am very grateful for the funding and the opportunity to really grow my business,” said Marcheta Holden. "The residents and I are grateful to the Torbay Volunteer Fire Department, and the Provincial Government through Minister Byrne, for making this equipment a reality and providing this extremely important service to our residents," said Mayor Kevin Parsons. "Our entire membership is grateful for the Provincial Government’s support, and we look forward to advancing all of our programs and collective initiatives in the coming months," says Richard Murphy. "The Resource Centre for the Arts is a grateful benefactor [sic] of this program," says Bert Riggs. “We are very grateful to the Department of Innovation, Trade and Rural Development for offering this program to not-for-profit organizations such as ourselves to enable such projects to proceed,” said Jim Miller. "We are grateful for the opportunity to avail of funding for this endeavour," said Rodney Blanchard. "We are grateful to the Department of Environment and Conservation for funding this project," said Captain Jan Negrijn. "I am grateful to Minister Wiseman for the opportunity to move forward with this project, which we affectionately called ‘Operation Tooth’," said Dr. Geoff Smith. "We are grateful for the support of the three levels of government for $4.5 million," said Craig Rowe. "We are very grateful to the Provincial Government for their continued support of the Boys and Girls Clubs in this province," says Jackie McIsaac. "On behalf of the Northern Peninsula Regional Service Board, I would like to extend our gratitude and appreciation to MMSB for their continuous support in assisting us with implementing the Provincial Solid Waste Management Strategy on the Northern Peninsula," said Doug Mills. Cheers: to humour. One Internet commenter had an interesting question after Paul Oram was named the new provincial minister of health Thursday: who's going to be appointed to replace Oram in regularly phoning VOCM's "Open Line" to stridently defend the premier and government policies? [...] if there’s conflict, it’s going to make news. Criticizing the media for covering a “negative” story is like accusing fire fighters of putting out fires. Both are necessary facts of life. Indeed. And who knows that better (or should) than an opposition in a Westminster Parliament? Government proposes, opposition disposes. A necessary fact of life. Take, for example, the late provincial opposition in Dannystan, then led by the current Premier. Reproduced below are the headlines of every press release that the PC caucus issued in the two months ending July 11, 2002. That leaves 57. Of those, fully 52, again by this corner's count, are "negative" — critical of federal or provincial government policies and actions, or critical of federal or provincial political figures. Positivity? Well, Wally Young was positive about Big Droke, Williams about Lloyd Wicks, and Taylor about Their Norwegian Majesties. The only positive policy propositions in this sample are Osborne's holiday plan and the bit about physical education. This list doesn't even include the frequent use that their comms shop made of links to third-party content such as CBC or Telegram stories. Needless to say, the Little Shop of Tories wasn't linking to the upbeat and cheery. Why would the opposition party be so ruthlessly and unrelentingly negative? And, as part of an overall political strategy, it's one of those pesky but necessary facts of life. Government proposes, opposition disposes. When the Premier complains about opposition negativity, what he's really complaining about is that they are doing their job. Will summer hospital bed closures be permanent? Could European Union fisheries measures leave Nose and Tail more vulnerable? If government can't manage a tire recycling contract, how can it be trusted to manage a multi-billion-dollar Voisey's Bay deal? Congratulations to federal PC candidate Rex Barnes, elected Monday in Gander-Grand Falls. Premier Roger Grimes has promised Beaton Tulk a cabinet post if he wins the by-election in Bonavista North next week. The Tories call that a desperate move by a government about to lose another Liberal seat. David Zelcer reports. Roger Grimes confirms that he recently announced to a crowd of Liberal supporters at the fire hall in Lumsden that he has a seat at the cabinet table waiting for Beaton Tulk. Roger Grimes: "Being in the cabinet is an absolute guarantee. I'd love to have Beaton Tulk back working as hard as he was working for us before." Tory candidate Harry Harding says the Liberals are obviously worried. Harry Harding: "Oh, definitely. Yes. Why would he do it at this point in time? At least wait until they have the election over to see if he's elected and then, then make that statement. But to do it during a campaign, it's nothing only pure politics." But Beaton Tulk says there's nothing wrong with the Premier giving him credit for all the cabinet posts he's held in the past. Beaton Tulk: "I think the Premier of this province has looked at them and said we need this fellow to work for us and I think the people of Bonavista North have a right to know about it." Tory leader Danny Williams believes the Liberals are running scared. He says they probably have the same poll results the Tories have seen - results that Williams claims show Harding is now the front-runner. The much-maligned (though not by this corner) website redesign over at the Ministry of Truth (Provincial) comes with an interesting and useful new feature: a top-ten list. The first six on the list unfortunately all involve deaths. The seventh involves an “unable”. The eighth is a “snag”. Another tragic death story, crime, a ban, a loss, and more criticism. A risk, a loss, a ban, a tragic death, crime, and criticism. Of the CBC most-recommended stories, there’s one upbeat happy government announcement, and a story about a giant fish. More than 70% of the recommendations are for downbeat – dare we say, “negative” – news stories. Much the same picture obtains with regards to commentary, where two thirds of the comments on the most-commented local news stories are on stories whose headlines have some negative aspect. Every story must contain conflict. And that conflict was broken down into three sub-groups: man against man, man against nature, and man against himself. I knew this to be true in fiction, but it was a revelation to realize it applied equally to the real world; to news. Pick up any newspaper, or tune into any news broadcast. Think about the stories. Most often, it’s man against man – one person or group against another person or group. From civilized debate to all-out war. Now, thanks to the intertubes and the press’s new-found love of “social media” gimmicks, we can gauge not just the press’s interests, but also the public’s taste, at least somewhat quantitatively. The public loves bad news. Well, not the events themselves – generally speaking, the public doesn’t like it when other people die in tragic (or any other kind) of circumstances – but the public has a very strong appetite for the sad, the controversial, the negative, the conflict. The happy and upbeat? Not so much. Today's ceremony trumped a planned release of updated ER/PR numbers from Eastern Health, but Premier Danny Williams says that wasn't planned. Nothing could be further from the truth, as might say the guy who usually brags about how much effort he puts into planning stuff. St. John’s, February 23, 2009 – The tourism industry association, Hospitality Newfoundland and Labrador (HNL), is weighing in on the development plans for the Lower Churchill project. HNL supports Parks Canada in opposing the proposed route through Gros Morne National Park. “As the tourism industry association of Newfoundland and Labrador, we fully support Parks Canada in opposing the proposal that will see towers and lines run through Gros Morne National Park,” said HNL Chair Bruce Sparkes. "Running towers in front of dynamic and dramatic landscape is going to take away from the natural beauty of it," Sparkes said. "From a photographic, awe-inspiring point of view, it's going to take away that. And who wouldn't say, 'Gee, too bad they put that pole line there?'" "It's the crown jewel in our park system," says Sparkes. "To run a major power line down through this crown jewel ... there must be a better way." That was the last time Mr. Sparkes or HNN have commented on the issue in the media, and have, as of late, taken to declining comment altogether. Williams says he would prefer not to do have the line go through the park, but going around it could add more than $100 million to the cost of the project. "We can't just start carving out those kinds of dollars … without even have a proper costing. It's wrong to oversimplify it, but if it meant putting it into health care as opposed to putting it into UNESCO, I would put it into health care, he said. Funny. You might think the dichotomy would be putting some of that "it" into health care vs. putting "it" into a transmission line, especially considering that Danny Williams-Government doesn't actually put any "it" into UNESCO. But that's a digression. No, the bigger question is: if $100-million is too much to add to the cost of Our Dear Infeed... then what about the costs of Our Dear Infeed in the first place, as opposed to the alternatives — either for transmitting Labrador power to a market, or supplying Newfoundland with electricity? If we need all that "it" for health care, why would we spend hundreds of millions, if not billions, of "it" building a transmission line out of pure spite? Did we mention the new L'anse au Loup school? But to come in and, y'know, double- and triple-announce money that, that's given the appearance of being new money, that's just, that's misleading. May 9, 2001: This new allocation will provide for new schools at L’Anse au Loup, Lawn, Mud Lake and Postville and redevelopment of schools at Burnt Islands, St. Brides and Winterton. August 13, 2001: Planning has begun for the construction of new schools in Happy Valley-Goose Bay, Mud Lake, Postville, Lance-au-Loup, Burgeo and Lawn. December 21, 2001: Education Minister Judy Foote today confirmed the Department of Education's commitment to construct a new state-of the-art K-6 school in L'Anse au Loup. September 15, 2006: Education Minister Joan Burke joined Wally Young, MHA for the District of St. Barbe, and Don Brown, chair of the Board of Trustees of the Western School Board, in Port Saunders today to announce the construction of two new K-12 schools in the Western School District, one for Port Saunders on the Northern Peninsula, and the other for L’Anse au Loup in southern Labrador. April 20, 2007: In September 2006, the Provincial Government announced a new school for L’anse au Loup. Department officials are currently working with a consultant to develop estimates. June 19, 2007: "Projects are happening all over the province – in Port Saunders and L’Anse au Loup...," said Minister Burke. Apparently, they're building it out of press releases. Two independent thought alarms in one week? And both from central Newfoundland. The centralists must be over-stimulated. It makes me wonder what Mr. Williams knew six or seven months ago about the Hibernia South deal, and how close the consortium was to signing the tentative package? When did Mr. Williams actually know a deal was going to be struck? Mr. Williams is a lawyer, and I'm sure he's asked this question to clients and witnesses before. If you're not telling me everything about this matter, what are you not telling me about other items of public interest? If Mr. Williams wants a free ride, perhaps private business is where he needs to return, he can find it there. Otherwise, you're the top dog, and there's no vacation in that position. It is the opposition and the right of the people to continue to ask its government what it is doing. If Mr. Williams expects less then I'm afraid he's forgotten what a democracy is. And that's not even the most explosive thing he says. The time has come to get those elected officials (you know who they are) on the public record. The question to be asked is simple. What have you done to solicit the province to grant central Newfoundland the value of the hydro assets once used to make paper? We need to know what our MHAs have been saying to this government to give us the value of those hydro assets. What is their position on this issue? The Williams government needs to know this issue will not go away. Those seeking elected office in the upcoming municipal election need to know they will be pressed to have a game plan. Those MHAs who cannot explain their silence should also know they will be held accountable for their inaction. Their silence is not acceptable. Never was and never will be. Wonder if these good denizens of such a hot-bed of questions, and conspicuous lack of fealty, can expect phone calls? 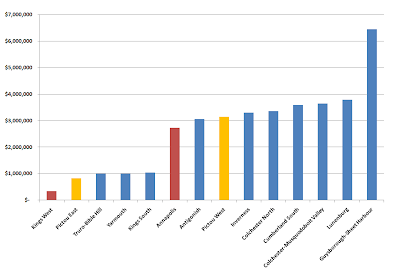 In keeping with this corner's fascination with rank-size graphs, here is yet another way of graphically representing the Nova Scotia highways-project data first exposed to sunlight by Parker Contrarian-Donham. Brian from Nl writes: While I'm still a mild supporter of Premier Williams, all his government's misteps of the past year is making it harder and harder for me to give him the benefit of doubt. If he insists on a transmission line through Gros Morne or don't soon make a public statement against it, I think Mr. Willimas will have met his match and the days of the teflon premier will be numbered. Jones told The Beacon the province can only produce a limited amount of wind energy because it can cause water to spill from hydro dams if excessive amounts are produced. This roadblock will be eliminated with the introduction of a transmission link in 2016 for the Lower Churchill hydro project. That's an awfully definitive statement, both in verb choice and timeline. More definitive than the language used by the proponents these days: remember, "project sanction" is supposed to happen in 2009. That's this year, the one half-over, if you weren't keeping track. "When we look at adjacency, none of the oil comes to Newfoundland and Labrador, yet we deserved a portion of it. We deserved to generate some income to the province because of our adjacency to that oil in our offshore," [Sean Cooper] said. "The premier gets $2 billion because of adjacency. Now we are here in the Exploits region next to a power generation that drove the economy of central Newfoundland for 100 years." "Some people in the region have been calling for the creation of a community trust fund, but government will not and cannot approach economic development in the province in this fashion," said Minister Skinner. "While we continue to work with the Community Development Committee – a dedicated 15-person team consisting of local community, business, and union leaders – to revitalize the central region, we are equally committed to the economic and social development of all areas and regions of the province. Our policies must balance regional requirements." We should be concerned about the fact that most of our processing in the fishery is done outside our Province. We need to be concerned about adjacency. The Word of Our Dan. So why the hard line against adjacency when it comes to hydro benefits? Unfortunately, there are methodological problems with this analysis. Prior to the last election, most rural ridings were in Tory hands, and that’s where provincial highways are located. MacLean [sic] acknowledges this, but then miscounts the rural ridings by accepting a Wikipedia definition that excludes such urban ridings as Cape Breton North (Tory), South (Liberal), and Nova (NDP), as well as Glace Bay (Liberal). There are few provincial highways*, and only one paving project, in any of these ridings. Alrighty then. In addition to striking out the Wikipedia Halifax inset, let’s also strike the industrial Cape Breton one, which eliminates five more seats from consideration. The total for our “rural” seats held by the three parties, after the 2006 election, is now 21 Tories, 8 Dippers, and 6 Grits. 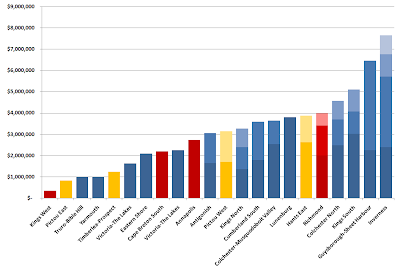 Where (A) is the percentage of rural seats held by each party, (B) is the percentage share of the number of projects put forward by the Rodney government, and (C) is the percentage share of the total dollar value of those projects. 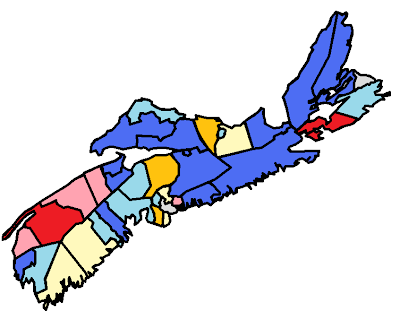 The colours follow the traditional partisan colour scheme, with the darker, saturated tone indicating districts in which Rodney put forward highways projects, and pale tones, districts where he did not. Turning this map back into numbers, the Rodney government proposed work in two** out of six rural Liberal districts (33%); three** out of eight rural NDP districts (38%)… and 13 out of 21 rural PC districts. What you have here is the Galilean telescope of pork-barrel pavement, in which the list of “priorities” is focused through not one, but two electoral lenses; the federal one was the subject of Contrarian’s original, also cartographic, posting. In short, this all looks like a reduced-scale model of the Peckford-Crosbie Roads for Rails plan, twenty years later and one province over. * College Road in Truro, parallel to and one block south of Rte 4… is that a provincial highway? ** Or three and four, counting line-straddling projects which are mostly located in what were neighbouring PC districts. June looked a lot like a re-match of May, and not just in terms of the final score. It got off to a great start, with defending champ Trevor Taylor first out of the gate. Darin King and Susan Sullivan answered him later the same day, but before the day was even half over, Trevor, assisted by John Hickey, responded with another. It would be a week before he'd take a slight lead, ending a seven-day drought on the 8th, assisted, for the second time, by Hickey. And no, this wasn't a case of re-announcing the same money over and over again, because that would be, that's just misleading. Tom Hedderson got on the board on the 11th, but Trevor, again with the help of Hickey and also Jerome Kennedy, answered that one nicely. Yet again, this was just letting The People know after; wouldn't want to mislead The People or anything. But Tom Hedderson is made of stronger stuff than he's often given credit for. He was celebrating on the 16th, and willing on the 17th; his third for the month, putting him back in the game just one back of Trevor. Doc King added to his single on the 18th, and Patty Pottle went on the big board on the 19th, making it an exciting four consecutive days. But some of the oxygen may have been sucked out of the room, as there was again a week-long gap in the scoring. Trevor roared back ito the game to end the lull on the 26th, followed in short order by Shawn Skinner with his first of the month, which was entirely substantial and not at all puffery. Upstart Hedderson ended the month on a high note, and like Skinner was full of substance; pages and pages of substance. Hedderson came within one point of tying Trevor Taylor, but when the buzzer came down on the scoring, at a quarter to five (please do not shoot anyone), it was all academic: your June Sycophant of the Month, now a three-peater, is Trevor Taylor. Congratulations Trevor, and to all on an exciting month! Geoff Meeker has done a superb public service with his two-part (so far) posting on Premier Thick-Skin's very thin skin. Part one dealt with some of his thin-skinned run-ins with members of the media. Part two, more disturbingly, described a run-in with an ordinary resident from Stephenville. If anyone out there in the intertubes has the capsules of the follow-up calls, identifying the callers (at least insofar as they were identified on-air by VOCM) who essentially called Rumbolt a liar... well, you know what to do.